MONTEVIDEO: Brazil became the first team to qualify for the World Cup on Tuesday after beating Paraguay to clinch an eighth consecutive victory as Argentina’s campaign stumbled after the shock suspension of Lionel Messi. Five-time champions Brazil had been left waiting in suspense after goals from Neymar, Philippe Coutinho and Marcelo handed them a 3-0 win over the Paraguayans at Sao Paulo’s Arena Corinthians. But Uruguay’s upset 2-1 defeat to Peru in the day’s final South American qualifier combined with other results meant Brazil are mathematically guaranteed a place at next year’s finals in Russia. The qualification completes an astonishing turnaround for Brazil, who less than a year ago were in crisis after taking only nine points from six games. That run of results had left the Brazilians outside the qualifying places in sixth place. The further embarrassment of a first round exit at last year’s Copa America Centenario only deepened the sense of despondency. However the sacking of former coach Dunga and the appointment of former Corinthians coach Tite was the catalyst for a Brazilian resurgence. That revival saw Brazil take maximum points from their next eight qualifying games, leaving them nine points clear on Tuesday with four games left. “When I look at my family-the players-and when we talk to the fans and see how happy they are, that’s when you think ‘I’m part of something very special,’” Tite said after Brazil’s qualification was confirmed. Against Paraguay, Brazil were already in party mode, with Coutinho opening the scoring on 34 minutes following a deft one-two with Chinabased midfielder Paulinho. Neymar had a chance to make it 2-0 in the 53rd minute from the penalty spot only to see his kick saved by Anthony Silva. On 64 minutes Neymar doubled Brazil’s tally, collecting the ball deep inside his own half and setting off on a surging run down the left flank. 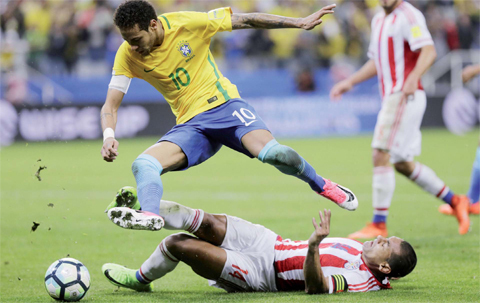 Neymar’s dribble ended with him curling in a shot which took a slight deflection on its way into the Paraguayan goal. Real Madrid defender Marcelo added a late third to seal Brazil’s win.